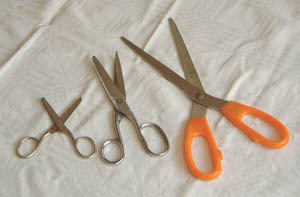 For other uses, see Cutting (disambiguation). Cutting is the separation or opening of a physical object, into two or more portions, through the application of an acutely directed force. Implements commonly used for cutting are the knife and saw, or in medicine and science the scalpel and microtome. However, any sufficiently sharp object is capable of cutting if it has a hardness sufficiently larger than the object being cut, and if it is applied with sufficient force. Even liquids can be used to cut things when applied with sufficient force (see water jet cutter). The stress generated by a cutting implement is directly proportional to the force with which it is applied, and inversely proportional to the area of contact. Hence, the smaller the area (i.e., the sharper the cutting implement), the less force is needed to cut something. It is generally seen that cutting edges are thinner for cutting soft materials and thicker for harder materials. This progression is seen from kitchen knife, to cleaver, to axe, and is a balance between the easy cutting action of a thin blade vs strength and edge durability of a thicker blade. Cutting has been at the core of manufacturing throughout history. For metals many methods are used and can be grouped by the physical phenomenon used. Chip forming – sawing, drilling, milling, turning etc. Every method has its limitations in accuracy, cost, and effect on the material. For example, heat may damage the quality of heat treated alloys, and laser cutting is less suitable for highly reflective materials such as aluminum. Laser cutting sheet metal produces flat parts and etches and engraves parts from complex or simple designs. It is used over other cutting options for its quick process and customizable abilities. ^ "Basic Studies Of Stress And Strain" (PDF). www.freestudy.co.uk. Archived (PDF) from the original on 13 December 2016. Retrieved 5 February 2016. ^ "FAQ: What are the problems with laser cutting of aluminium and how do I overcome them?". www.twi-global.com. Archived from the original on 2016-01-21. Retrieved 2016-02-05. ^ "Laser Etching & Cutting Services". HPL Stampings. Archived from the original on 2016-03-25. Retrieved 2016-02-05.